Skills used: Research, Wireframing, Logic&Task flows, Visual Design, Video Editing, HTML/CSS prototyping. Process: Literature review, Data gathering, Ideation, Exploration of existing solutions, Task&Logic building, Wireframing, Testing&Evaluation, Prototyping. 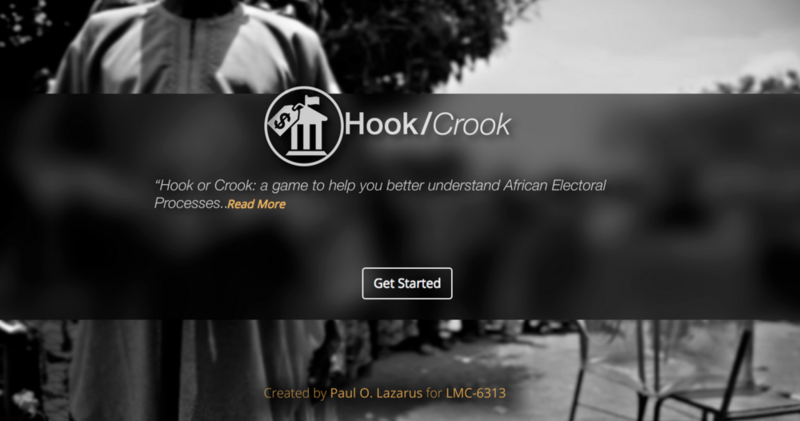 Hook or Crook is a web-based simulation game that portrays issues within African elections as outcomes of choices made during game play. It weaves real life electoral issues within a fun game experience and in the end educates players about these issues. This is an important problem worth solving because, having better understanding of a social cause helps people transition from being mere bystanders to active proponents of the said cause. The main goal was to create a enjoyable experience for a somewhat less enjoyable social topic - in this case, African elections. The solution had to leave players more knowledgeable about African election upon quitting the game. I first went through relevant literature pertinent to African elections. Based on previous research work, I had access to data collected on the field regarding African elections. Based on these information, I streamlined and modeled the interaction constructs and the character profiles for the game. This was reflected in my choice of five variables, three outcomes, 4 stages and 4 different characters. Interaction designers often explore different legacy forms of interaction in designing new products. For this project, I explored simulation games because they reinforce retention of game concepts through parameterized replay. I evaluated Plague to get a sense of the strengths and weaknesses of media artifacts within the simulation game genre. In designing the look, feel and interaction of the game, I was guided by some game mechanics I carefully created and fine-tuned. I had five variables, three possible outcomes, four characters and a point based system. I iterated and tested two different designs before arriving at the final prototype. Game feature selection was guided by the characteristics of the target user/player. During prototyping, I made use of Hand Sketches, Balsamiq, Illustrator, Photoshop, Keynote and HTML/CSS. Seven users evaluated the prototypes for clarity, flow and usability. In the end, their feedback was used in fleshing out the final prototype.